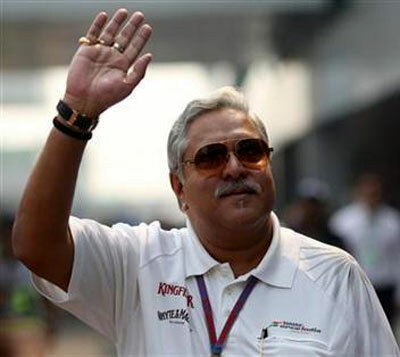 Rediff.com » Business » Is Vijay Mallya on the comeback trail? Is Vijay Mallya on the comeback trail? Vijay Mallya never fails to amaze you. After losing Kingfisher Airlines, Mallya is fighting a battle to retain his chairmanship of United Spirit Ltd (USL), a company he sold to UK based Diageo. Again, after being forced to resign as chairman of Mangalore Chemicals and Fertilizers (MCF), Mallya is now keen on increasing his stake in the company. A Business Standard report says that liquor baron Vijay Mallya’s UB Group intended to increase its shareholding in the company. It plans to buy back shares from the Saroj Poddar-led Zuari Group to equalise the shareholding of both companies in MCF. Mallya, despite resigning as chairman of MCF, engineered a sale of the company to its preferred partner. Mallya teamed up with industrialist Saroj Kumar Poddar to ward off a hostile takeover bid on the company from Pune-based Deepak Fertilisers and Petrochemicals. Poddar persuaded Mallya to back him and, along with the strength of his own 16.4% stake, made sure Deepak Fertilisers didn’t get close to acquiring a majority stake in MCF. Deepak Fertilisers threw in the towel and has been selling its holding in MCF in the market. Block deals submitted to the exchanges reveal that Deepak Fertilisers has sold a substantial part of the 31.25 per cent stake it had built up over past two years. Deepak Fertilizer is now left holding a residual 5.22 per cent in MCF. The Business Standard report quotes Vijay Mallya’s note to the accounts while declaring the result of United Breweries Holding, a holding company of the UB group. The note says "(By) an agreement between UB Group and the acquirer, (we) have an option to purchase such number of shares from the acquirer so as to equalise the respective shareholdings of both. The board has resolved to exercise this option in due course." Post the open offer, Poddar managed Zuari group holds 53.3 per cent of MCF, while Mallya holds around 22 per cent through its various entities. While analysts have questioned the logic behind Poddar willing to sell a part of his stake to Mallya, a moot question is: how will Mallya buy it? Vijay Mallya is fighting a ‘wilful defaulter’ tag in various courts across the country. Some of the 17 banks on whom Mallya has defaulted have named him as a wilful defaulter. Mallya is contesting these charges in various courts across the country. Mallya is not paying the banks claiming he does not have the money. By shelling out money to buy Poddar’s stake he would be weakening his case against the banks who can say that he has money to buy MCF but not pay them their rightful amount. Already the government of India through its various agencies is tightening the noose around Mallya. USL, the liquor company formerly owned by Vijay Mallya, is now under twin investigations by the government of India after it said that large sums of money were diverted to other group entities without the approval of shareholders. The corporate affairs ministry and the income tax department will probe the company's books. These probes come after a PricewaterhouseCooper (PwC) investigation revealed that as much as Rs 3,000 crore (Rs 30 billion) was diverted to other group entities such as Kingfisher Airlines, which is now defunct. The diversion happened between 2010 and 2013, many of which were not authorised by shareholders. This investigation is over and above the ongoing probe by SEBI which has asked Mallya’s group holding company UBH (United Breweries (Holdings)) to restate its financial accounts for two previous years to address issues flagged by auditors. The company, however, has already approached the Securities Appellate Tribunal (SAT) against this order and has secured an interim stay. The only way Mallya can increase his stake in MCF, the only jewel left in his crown, is by using his holding company to raise money. Currently, no bank will be willing to lend money to the Mallya group. And if Mallya loses the case against the ‘wilful defaulter’ raising money will be impossible. But here too SEBI is watching him closely and shareholders will not like diversion of funds. Further, UBH too is not in the best of financial health. It has been able to stay afloat by selling its investments. While Mallya might want to equalise his shareholding with that of Poddar, he does not have the resources to do so, at least not without crossing swords with all the stakeholders of Kingfisher. Since losing Kingfisher Airlines Mallya has been on the defensive. This is the first instance where he has shown signs of a comeback. It seems he has a lot of fight left in him.